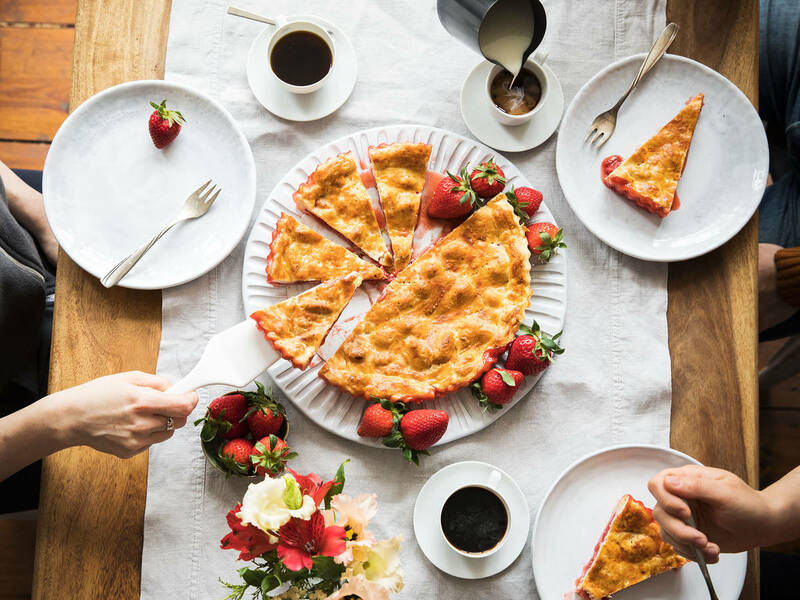 Just in case you were weren’t sure, we’re here to tell you—strawberries are back in season, and what’s better to celebrate the arrival of the nation’s favorite fruit than this sweet strawberry pie recipe, created by Mathis Neubauer. What’s so special about this pie? Needless to say, strawberries are the star ingredient of this dish. The pie is beautifully crisp on the outside with a tender golden crust, but soft and juicy on the inside with a ruby red strawberry filling. Use fresh, ripe strawberries for a pie filling that is more flavorsome than the sweetest strawberry jam. Gently flavored with a pinch of cinnamon, orange zest, and rich knobs of butter, you truly can’t go wrong with this summery pie. This straightforward pie recipe is a wonderful way to welcome strawberry season. Not too small, not too large, it’s the perfect sized dessert to take care of your cravings for a second (or third) helping, or inspire you to host a casual summer party with your friends and family. Plus, the smell of ripe strawberries will linger in your kitchen for hours after baking this pie—as if you needed another reason to make it. Our Kitchen Stories test team devoured the pie within minutes, saying it’s “insanely delicious” and “not at all too sweet”. We encourage serving it à la mode with scoops of vanilla ice cream or dollops of fluffy whipped cream. Due to the rather long baking time and the use of fresh fruit, the pie filling needs time to cool down after baking to set up. Using gelling sugar is a good way to solidify the inside a bit more, while it’s also important to let the pie cool completely (we even put it in our freezer for half an hour before serving) so that the filling doesn’t run out when you cut it. There are lots of ways to customize the pie: using vanilla and basil instead of cinnamon and orange, adding in a handful of raspberries and blueberries for a triple berry pie, or working out a complicated lattice crust to impress. Be creative and come up with your own version! You’ve created a special seasonal recipe? Why not share it with the Kitchen Stories team and our hungry community! Simply send your recipe to community@kitchenstories.com.